A few weeks ago I flew to Australia to take part in a MovNat workshop run by Vic Verdier. Let’s start by talking about what this MovNat concept is all about… It’s a recently developed physical education and fitness system based on developing movement efficiency and adaptability, among other principles, and exploring the full range of evolutionary natural human movement. It is also more than its movements, and stunning natural landscapes (check out Exhibit A above in which me and my friend are training in Wellington’s Central Park). It glorifies a lifestyle that emphasizes choices; such as being barefoot, eating a paleo diet, being mindful, and other things that support optimal physical and mental development. It’s underlying foundation is the concept of evolution, and that we as humans have evolved into our current state over hundreds of thousands of years. Our modern environment and lifestyle, however, have only been in existence for the past few hundred years. Evolution generally works on a large time scale. Yet modern advancements and things such as Moore’s Law work on an incredibly fast, exponential scale. If you do that math, we are essentially out of date – our bodies and minds evolved in a different era, back in paleolithic times, and they do not cope ideally with our current surroundings, our modern diet, and our modern exercise patterns. Our bodies expect us to live in an environment that no longer exists and to behave in ways that we no longer do. This is a depressing thought. What do we do? Going back to our roots and being wild and free like cavemen is a very tempting quixotic notion. It also has an air of anarcho-primitivism, of wanting to go back to the good old primal days, before the computer screen you’re reading this on existed, which have been forgotten and mistakenly glorified. MovNat is not aiming to re-create paleolithic times. That would be stupid and detrimental to humanity. Infact, MovNat looks back at our evolutionary history for clues of how we can live healthy and be strong and feel fulfilled by connecting with our true potential. The way we as humans internally operate today is still based on factors that would have existed hundreds of thousands of years ago. And that is beautiful. The way our attractions and emotions erratically play-out is the stuff of art. Our bodies are intelligent, adaptive systems. And yet, in typical human fashion, we are not quite intelligent enough to design our environments to be the best fit for our ancient biotechnology to thrive in. If we want to be fit, healthy, and happy… then be true to our nature, or so MovNat claims. On the first day, I arrived late at the workshop with a hang-over. Our training ground for the next two days was a beautiful park in Sydney with clean, blue skies, and what seemed like an endless amount of dogs and their owners running past. After introductions and a short walk through the bush, the instructor asked what we expected in an exercise workshop. Pushups? He said. Alright, let’s do some pushups. We dropped to the grass, pure with mildew. We busted out 20 push-ups. Then, we did some more with our hands staggered, one above the other. And then some more with our hands the other way around staggered the other way. Next we did even more, this time with our hands together on the ground, making a diamond shape and working triceps. Then it was time for one-arm push-ups. Do as many as you want, the instructor said and went right into them. I think it was only me, one other guy, and the instructor who could do them. This was functional fitness, I realised. This was real-world fitness. Take something as simple and as common as a push-up and throw the body off balance by staggering the arms or doing it one handed and it suddenly becomes a different ball game. There was no padded floors or perfectly balanced and weighted equipment out here, folks. In the natural world, in which we evolved, we had to operate by doing complex, difficult movements in an ever changing environment as we moved through nature. And that ideal of fitness is what MovNat is going for. 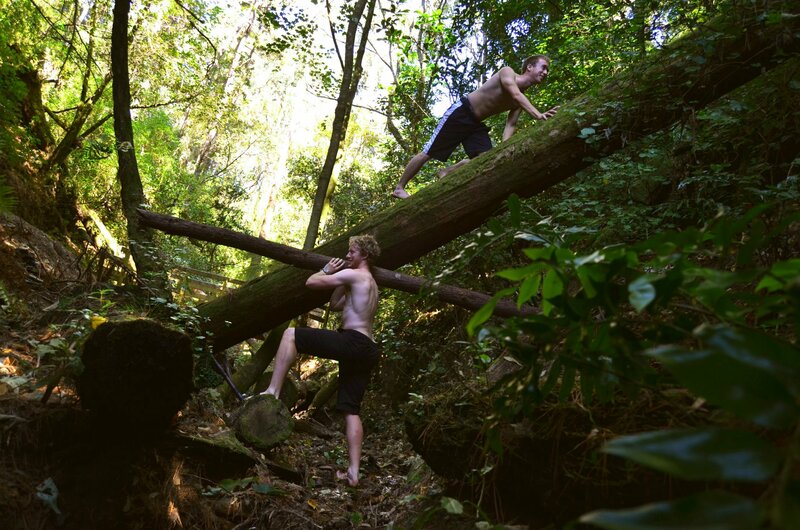 The rest of the day we crawled, rolled, balanced on logs, ran barefoot, and covered various other natural movements. The next day we climbed, threw branches at one another, lifted and carried tree stumps, jumped, and practiced self-defense. MovNat as a system covers 13 movement abilities which are detailed here. These movements are guided by 10 principles which are detailed here. At the end of each day I was covered in dirt, my feet were worn and filthy, my forearms were scratched from climbing a tree, and I was ready to lie down. This made me feel so damn alive. I never want it any other way! How did being true to my nature turn out? Exhilarating. Awakening. Unleashing. De-stressing. Life-changing. And the instructor, Vic Verdier, was inspirational. One of the amazing things about the workshop was going barefoot. It felt real and connected, as if something I’d been searching for had been found. We covered barefoot running, which I won’t go over in detail here. I’ve done a barefoot running workshop before with Vibram and I’ve done one in the pose method. This MovNat variation was pretty much the same as what Vibram taught me, except Verdier’s teaching style was eminent. Personally, one new experience was we closed our eyes and run blind towards and straight up a small hill. We turned around at the top, we did have a partner with their five sense intact running next to us to tell us when to stop before we hit the fence at the top of the hill, and then we ran back down the hill with our eyes still closed. The result: what do you need to do differently when you run up-hill, how does your gait change? Answer: it doesn’t. You don’t need to push more with your legs, or take higher or longer strides. You just have to lean forwards more (from the ankles keeping body straight). I was of the school that believed running up-hill was a chore. On the way down you actually have to actively slow yourself down, using barefoot running technique (increase cadence to take fast small steps and use arms to balance). Running down-hill is actually harder than running up. The rules of nature were being flipped around. But that’s precisely the point of MovNat – challenging accepted views of fitness and movement that aren’t effective. Society has gotten itself into a position where, as obesity, ‘lifestyle diseases’ and mental illnesses continue to increase, its norms of fitness are not potent for the broad population. Since arriving back in Wellington, I’ve been training in Central Park and in Eastbourne. There’s something connective and refreshing about being barefoot in nature. And I’m not talking trail running, I’m talking walking off track through dense bush, walking in streams, walking over fallen trees, and so on. This is beautiful, majestic movement and it’s also hard exercise, but it’s exuberating and empowering. I’m moving my training in this direction. At least one morning a week I’m going to start the day by getting out and moving in nature. I’ve never felt more alive. MovNat is fully scalable, and suits any individual regardless of experience, condition or gender. 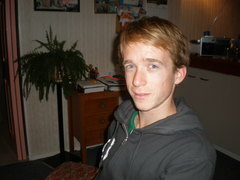 Max Bell is studying sports business management at Massey University and is an instructor for the New Zealand Parkour Association. He has recently started his own blog .